The Black Rose Tavern won ‘Best Overall Bar in Edinburgh’ at the Best Bar None Awards in 2017 and 2018. Now through to the nationals, the pub has started a new Campaign “Who is watching your drink? Put a lid on it”, that is targeting Drink Spiking. Considering this, we asked Alison a few questions about the new campaign, life at The Black Rose Tavern and Edinburgh. Q. Hello Alison, thank you for taking the time to answer this Q&A. Firstly, could you please tell us a little bit about The Black Rose and the pub’s history? Has it always been a Rock pub? There has been a pub on this site for many years. It was renamed The Black Rose Tavern and became a Rock bar 12 years ago. Prior to this it was an Irish bar, and further back it had dancing girls, so has quite a colourful past! We still get customers in who remember it from years ago as well as more recent returning customers. Q. What’s it like working in an alternative venue in Edinburgh? The Black Rose is a fantastic place to work. We attract a broad range of customers with the live music we offer, and no two days are the same. We have a great team of staff who are friendly and welcoming. Q: Edinburgh is a very popular tourist destination; how do you balance that with regulars? We are very lucky to have a core of regulars who support us all year. They come for various reasons, the menu, the banter, karaoke etc. Predominantly however we are a tourist pub. We welcome children until 7pm as long as accompanied by an adult. A comprehensive menu along with a dedicated gluten-free menu offers something for everybody. Q: Do you find that having a theme, or subculture slant on the Pub gives you a competitive edge? I think being a Rock bar definitely gives us a competitive edge, people are drawn by the Rock Jukebox and entertainment on offer. Our entertainers play music that people can sing along with and on most nights the place is bouncing. We also have Karaoke nights which are popular and open Mic nights where people can get involved. Some of our entertainers have started out this way. Q: You played an important role in launching the ‘Ask for Angela’ campaign in Scotland, could you explain a little bit about this for readers who might not be aware of its existence? The Ask for Angela Campaign was started in Lincolnshire by a lady called Hayley Childs. We became aware of it and thought what a fantastic idea it was and contacted Hayley to ask if she was ok with us promoting it here in Edinburgh. 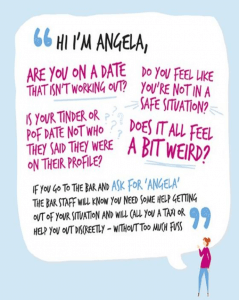 Posters are put in toilets alerting customers to the fact that bar staff are trained to discretely offer assistance if asked for Angela. No unnecessary questions will be asked. In this day and age with people meeting online sometimes, you feel uncomfortable in a situation and whilst no offence has been committed , you might feel the need to remove yourself from a situation. Bar staff will help with this. Be it by calling a taxi or keeping you in a safe place until a friend or family member arrives. People do not always give an accurate portrayal of themselves online and may not be what you are expecting. Q: ‘Ask for Angela’ is a couple of years old now. Do you think enough pubs have and clubs have taken up the ‘Ask for Angela’ incentive or could more be done? Initially, we walked to central pubs giving out posters and encouraging staff to support the idea. This, however, wasn’t feasible for all venues, so we attended pub watch meetings within our area and managed to spread awareness that way. Many pubs adopted the campaign but the more involved the more effective it will be. We have had amazing support from Police Scotland, the licensing officers, and the council. It is to become a part of the council’s strategic plan alongside drug awareness campaigns etc which is fantastic. Q: The new ‘Who is watching your drink? Put a lid on it’ campaign seems such a simple and great idea, how are you planning on promoting it? The ’Put a lid on it campaign’ is very exciting. We have all seen how easy it is to spike a drink. 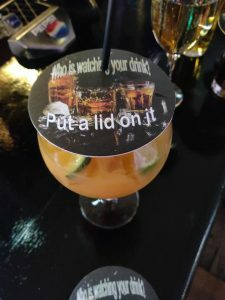 In Scotland, it is common practice to put a beermat or napkin on top of your glass if you are leaving it unattended to alert bar staff that you will be returning. We thought to expand on this a hole punched in the beermat to facilitate a straw would be a simple, recyclable way to also help prevent drink spiking. We will continue with pub watch meetings and working with the licensing officers also Best Bar None officers. These people have a greater reach than we do however anybody who wishes to can email us directly at blackrosestreet49@hotmail.com for a printable copy of either poster and we will happily forward them on. Q: What do other pubs and clubs need to do if they want to get involved with either of the campaigns? As mentioned we are more than happy to forward posters to venues interested in adopting either/both campaign. Whilst we chose to print beer mats with the campaigns on posters are a cost-free way of promoting and to participate in the ‘Put a lid on it campaign’. All that we needed was an inexpensive long reach hole punch. We tried different kinds until we found one that worked, as the cost of buying pre-punched was not feasible. Besides most venues already have standard beermats readily available. Q: How did you first get involved with Best Bar None? Is it something you’d recommend to other licensees? Several years ago we participated in the Edinburgh pub of the year which whilst we did well, we felt it was a popularity contest based on newspaper sales and really just a marketing ploy by the paper running it. We became aware of BBN through media and decided to enter as it is industry based and criteria must be met. There is a real sense of achievement in winning an award based on merit. I would definitely recommend other licensees look into applying. We have found staff take pride in the fact that we have won awards and are keen to ensure we do well in the future. 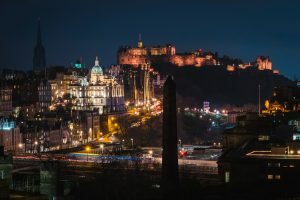 Q: Finally, Edinburgh is known for its history and often listed as one of the most Haunted places in the UK. Are there any good tales or ghost stories associated with the pub? We have one ghost, a wee old man who appears occasionally but he causes no trouble and we have no idea why he is there. It’s nice to think he is enjoying the atmosphere and can’t bring himself to leave. Thank you for your time Alison, congratulations with the ‘Ask for Angela’ campaign and all the best for the future with the ‘ Put a lid on it’ campaign.